The birth of a child is one of the most exciting and monumental moments in a person’s life. What happens if something goes wrong in the delivery room and your child is left with severe or fatal injuries? What happens when you find out this problem could have prevented during pregnancy or labor? Birth injuries and birth complications are far too common in the United States. Infants are injured every day because of insufficient or improper medical care. Some complications are preventable, some conditions could have been diagnosed during pregnancy, other problems should have been observed during labor and delivery. There is not necessarily one category for every birth injury. These shades of gray within the long list of birth injuries require the expertise of a birth injury attorney to help you figure out what could have been done differently and where you can go from here. If your child or you have suffered from one or more of the following birth injuries or complications, call Thurswell Law immediately to discuss your case and find out how you can seek monetary compensation. If an infant suffered trauma during birth, a physical birth injury is usually apparent immediately. Some conditions that are the direct result of a birth injury, however, are not visible until the child gets older. Parents may realize as their child grows that he or she is not reaching developmental milestones. These are some of the first signs of a birth injury. A child who develops a condition associated with a birth injury can go on to lead a normal life with therapy and ongoing medical care. Some children, sadly, are permanently altered. They need around-the-clock care and they will never lead independent adult lives. These situations require money, time, and lifestyle changes, which can lead to financial and emotional strain. Obstetricians are tasked with the important job of caring not only for the growing fetus but the expectant mother. Regular testing, sonograms, examinations, and more are designed to be administered throughout the pregnancy to ensure that mother and baby are both in good health, infection free, and unlikely to develop complications during delivery. Without proper prenatal care, diagnoses, and monitoring, a birth injury can result. This extensive list of birth injuries in this category makes it clear just how critical quality prenatal care is for expectant mothers and their babies. Delivery rooms are equipped with advanced technology and extensive staff who are trained to monitor every laboring mother so she is able to deliver safely and speedily to prevent complications. 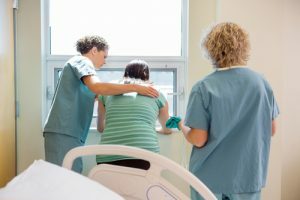 Unexpected situations do arise requiring emergency treatment and quick decision-making, but that is the nature of labor and delivery – it is a happy environment, but also one that is especially critical to maintain the health and wellness of the infant and mother. Any breach in the standard of care can lead to a birth injury that could otherwise have been prevented. In a mother’s womb, a baby is provided with the oxygen and nutrients to survive. Once labor starts and the child begins the journey into the birth canal, complications can arise that cut off the child’s oxygen supply. An emergency C-section or other intervention may be necessary to safely deliver the baby and save its life. In the delivery process, however, delayed or poor decision-making can lead to oxygen deprivation and irreversible health conditions. Babies born prematurely or with health complications not necessarily caused by a birth injury will be placed in the neonatal intensive care unit (NICU) for specialized care and treatment. Without proper monitoring, treatment, and diagnoses, further complications can develop in this environment and lead to serious, life-threatening conditions for the infant. Premature babies are at a higher risk of developing health problems or being born severely underdeveloped. Without proper prenatal care and postnatal care, these infants are at risk of developing potentially life-threatening birth injuries or long-term health problems. Some babies are seemingly born healthy but develop complications within 24 hours after their birth. Improperly or insufficiently conducted examinations of the infant while mother and baby are still in the hospital can lead to a missed sign of infant distress. Signs of a birth injury can also become clear as the child grows and fails to reach developmental milestones. To fight hospitals, insurance companies, doctors, and other healthcare entities for a birth injury or medical negligence, enlist the services and expertise of the Michigan birth injury lawyers at Thurswell Law. We have built our name on getting justice for thousands of babies and their families since 1968. We will never charge a fee unless we recover money. Your family has already suffered enough – emotionally, physically, and mentally. Don’t suffer financially too. Call Thurswell Law today.